ReciKLAONICA squat, located on 66, Heinzelova Street in Zagreb, is threatened with eviction. 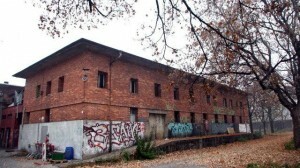 The informal collective of artists and social activists that develops its activities in the spaces of the old abandoned Zagrepčanka factory, owned by Zagrebački Holding, is addressing a call-out for solidarity against the eviction of the squat by the city’s authorities, who have already cut off the power supply. The building is one of around 300 abandoned and neglected spaces in the city of Zagreb, and for the last 19 months has served both as a housing project and a space that hosts various cultural and resistance activities. Free workshops, sharing food, free flea market, live concerts, free library, a music studio and rehearsal space, a free store ‘take it or leave it’, all available to anyone who shows interest in acquiring or sharing skills, cooperation and mutual assistance, and non-institutional organizing.